(Toronto) I discovered Bon Ivers’ (Justin Vernon) album For Emma: Forever Ago after hearing one of his songs featured on an episode of Grey’s Anatomy……don’t’ judge me. I instantly loved the “sound of a man left alone with his guitar and his memories” (Pitchfork). And when I discovered that he had isolated himself in the woods for four months to write it….I lost my mind. It was like all my fantasies had been rolled into one big one and served in woolly touque. Thoughts of a beefy bearded man in a wool coat ala Gerard Butler, capably chopping wood and foraging for his food by day while nursing a broken heart and healing through the creation of haunting music in front of a roaring fire in the woods by night was almost too much to bear….almost. Mmmm I’ll be your skinny love…..I’ll lose like 25 lbs for you if you let me sit on your face. He was supposed to go on at 10:15 and as everyone knows bands never go on at their scheduled time. It’s 10:30 and I’m racing from work thinking….I’m gonna make it with time to spare and sure enough…..he went on at 10:13!!!! C’mon Bon! Rock stars make you wait! By the time I got there, got past security and made it inside I had missed most of the show….including Skinny Love! Who plays their best song early in the set anyway? I caught two songs and then two in the encore. What I did hear was fantastic. The place was packed and more humid than a Brazilian rain forest and speaking of brazilians, clearly I wasn’t the only woman there hoping to witness her fantasy on the stage. He could have done with a bigger venue but I think even he was overwhelmed and surprised by the turnout. And while attractive in his own way, sadly, up close, he doesn’t look like Gerard Butler in a plaid shirt…..but this. I think I can see his balls. 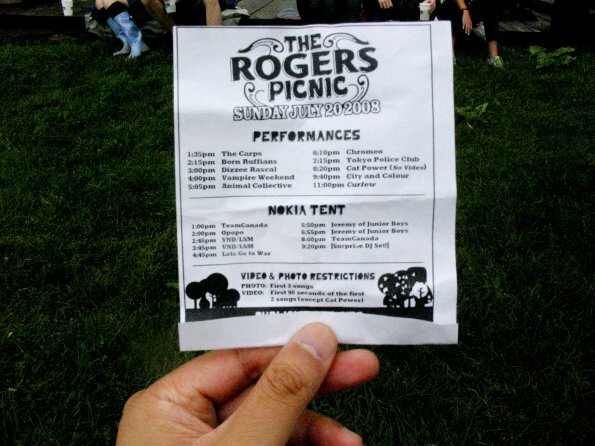 So as Ricky was saying, Animal Collective didn’t really connect with the Rogers Picnic crowd. Fortunately their set was followed up by Montreal-based Chromeo. This band’s dance friendly brand of electronic & guitar sounds was an immediate crowd pleaser. Even though it was raining pretty hard at this point, it was the first time that I felt that people were acting, well, festive, at this day-long festival. Big ups to the fans that wore rubber boots and embraced the mud and rain. Tokyo Police Club was up next. I really like a few songs from Tokyo Police Club, like “Your English is Good”, and I was glad to hear it live. I’d say this band put on a pretty good show, and got pretty into it. I was very impressed with the sheer energy coming out of keyboardist Graham Wright. I love it when musicians lose themselves in their music. But the big highlight for most of the crowd was Cat Power. This woman owns herself in way that is both rare and beautiful. Seeing her sing up close was pretty amazing. She puts so much of herself into her music, she seems so vulnerable, yet at the same time, exudes a “this me, this is who I am, deal with it” aura about her stage presence that was fascinating to see. So, now let me get to my rant about big-screen TV’s and text-messaging. There were two large TV screens on both sides of the stage showing a live-feed of the performers. I suppose this is a pretty standard feature of rock shows nowadays. What was new to me was that the bottom of the TV was reserved for a stock-ticker type deal where people could send text messages and get them displayed in more or less real time. This made for a weird concert experience. Now I admit that sometimes people had really funny things to say, like “no one is safe until nerd prosecution is over”. But by and large, the screens were cluttered with inane texts from hapless youth. Unfortunately for me, I am eternally enchanted and absorbed with shiny or moving objects. I was transfixed throughout. I just couldn’t help but be engrossed. This, with the addition of my complete inability to multi-task, meant that I spent more time reading the damn stock ticker than listening to the music. So I would say thumbs down on the ticker, but I would say thumbs up that Rogers Picnic seemed to make efforts to make this a green event. The last show was City and Colour. Unfortunately, perhaps because it was Sunday night, there was a mass exodus after Cat Power. We joined suit, but I left pretty happy with the live music I had absorbed throughout the day. (Toronto) When I go to a show and see four healthy guys, under 30 with normal hair and no beards take the stage, I get nervous. Call me old fashioned, but I want musicians to look like musicians. Hung-over, starving, smelly, emancipated, musicians with blood shot eyes. When Run With The Kittens took the stage at the Roundhouse, they looked like they just came from a spaghetti dinner at their parents place. 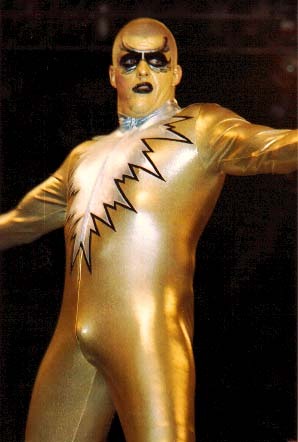 Yes, a spaghetti dinner where their parents forced them to dress up like Gold Dust and groom each other. From what I witnessed on Friday night, I would summarize Run With The Kittens as Los Straitjackets meets High School Musical, meets Wolf Parade meets Ice Capades. There is no doubt that they played hard and that they know how to rock out. After the Kittens rocked out for a while, they slowed it down, made funny faces at the camera men, then they yelled and rocked out some more. I left the show feeling somewhat confused, kind of like the first time I saw Cirque Du Soleil. What did I just witness? I didn’t feel the urge to run to the back to buy one of their CD’s, but on the other hand, I now feel compelled to check out their weekly Tuesday night show at the Cameron House. I’d see them again. I think? Toronto – What the hell is with the rain? Seriously. We are turning into Vancouver. Rain was the word of the day at the old and historic Fort York, home of this years Rogers Picnic . The hard working ladies over at Listen Harder were kind enough to provide me and Mark with media passes to cover this festival, so here is my account of it. I thought that Rogers put together a pretty well organized event. The music acts were actually on time. After the Flaming Lips V-Fest disaster from two years ago, this is a big issue specially with the imposed curfews. There was a large variety of food available (I had a pulled pork sandwich from Cluck Grunt Blow or something) and there was Wellingtons beer available, which is always a bonus. Unfortunately, the Welly’s ran out half way thru Tokyo Police Club’s set and I stupidly ordered a Coors Light (that or Molson Canadian was the only option). Yea, so after that debacle, I stopped drinking. I think the rain was a huge factor, it cooled the festival down, so I don’t think many people passed out and also, it turned the middle of the field to a mud pit, so all the Ex Pats in the room could close their eyes and pretend they were with the lads in Glastonbury. NY Hype Kids Vampire Weekend was given the 4:00 slot, way too early for a band of their immediate stature (re: popular). 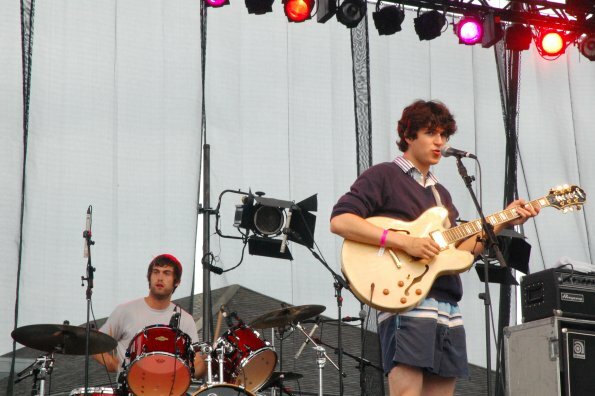 However, the kids in the band made the most of it – the lead singer wore an interesting dress shirt + v neck sweater + swimming trunks attire that I am sure will inspire preppy kids all over Toronto in the fall. Look for it at your local private school. I called it here first. Having been here for a concert in February, the band seemed genuinely happy to be here. They didn’t even seemed to be tired either, having played Pitchfork Festival just 24 hours prior. The set list was what you expect ie. everything off their debut album. The band even played a new song at the request of one of the fans. The bands live sound is pretty much the same as the bands studio sound. It’s pleasant and summery, perfect for a summer festival, if it wasn’t raining. However, the rain didn’t seem to dampen the spirits of the crowd and the band, as many people were dancing to the songs. Overall, definitely one of the highlights of the festival. As much as Animal Collective’s Strawberry Jam album was a highlight for eclectic noise pop fans, I would have to say that the Brooklyn band definitely generated a huge WTF moment for a majority of the crowd at Fort York, considering a lot of people came to see Tokyo Police Club, Cat Power and City and Colour, I wouldn’t necessarily put them in with an Pitchfork type Animal Collective sound. Anyways, the pair from Animal Collective came on with bright t-shirts and worked their craft on stage, mostly keeping to themselves. The rain really really started to come down at this point and I think a lot of people just went to find shelter. 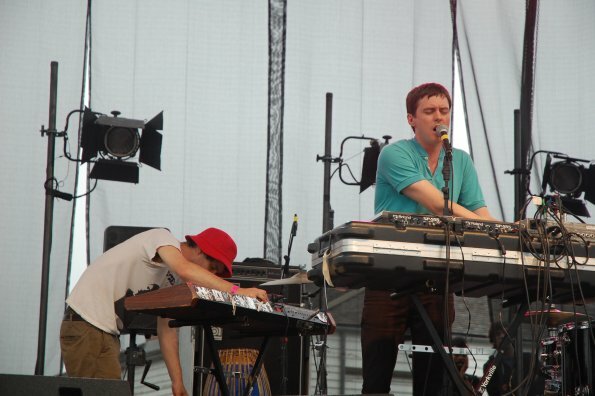 A highlight for me was the Panda Bear song Comfy in Nautica. Either way, I would probably think this was a mis-step on the part of the organizers, but that didn’t stop the band from pleasing their own fans. Stay tuned for Part 2, as there will be some nice pictures from the show as well.